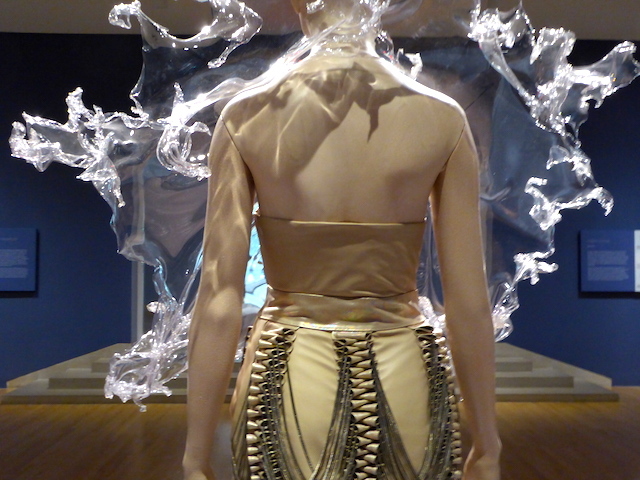 I recently saw a fabulous exhibit at the Dallas Museum of Art. 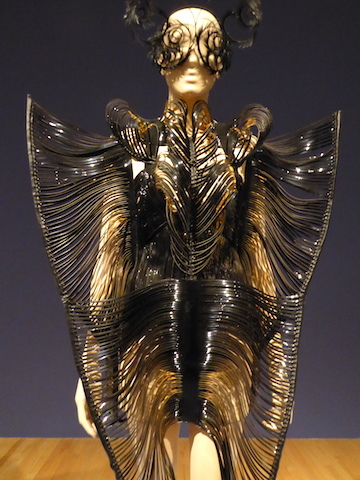 “Iris van Herpen: Transforming Fashion” is magical. 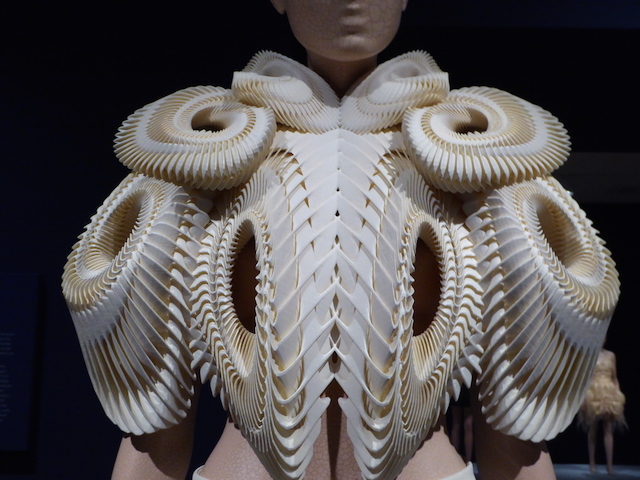 This young Dutch designer marries art and science to exquisite effect. 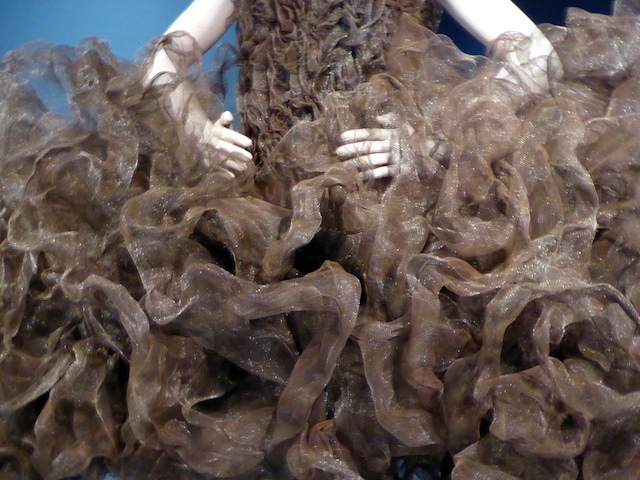 Her work made me look long and hard and think a lot about what fashion is all about, what the possibilities are. Ms. Van Heren is inspired by art, architecture, science and technology. 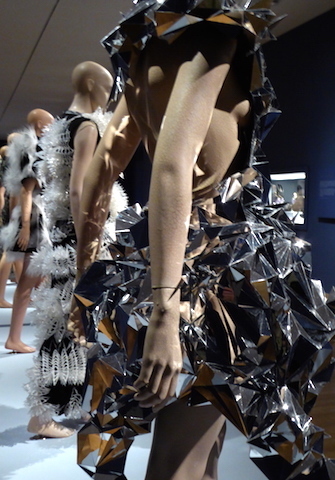 She describes each collection in terms of its influences. 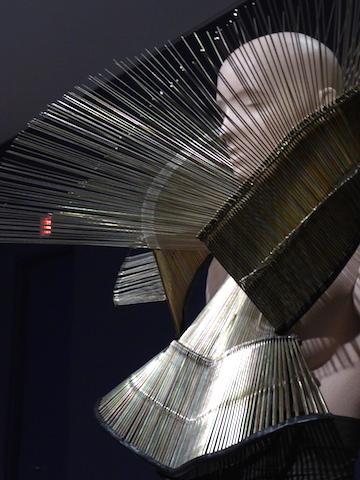 Is this “wearable art?” Maybe. 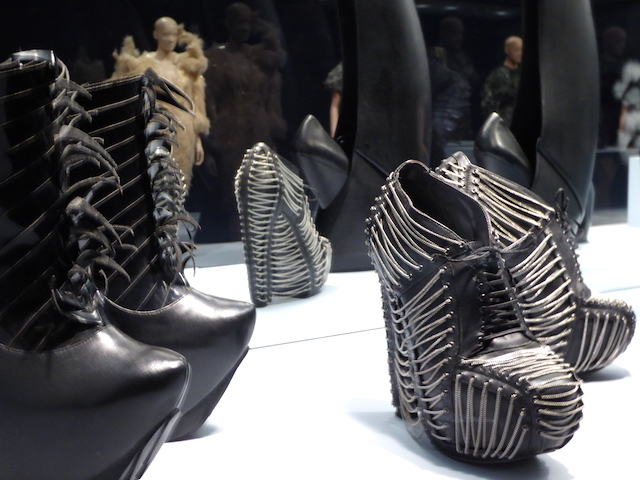 The creations cover or encase the body and in fact, are presented in runway fashion shows, although I can’t imagine anyone walking in the shoes shown in the exhibit. A video shows they can! 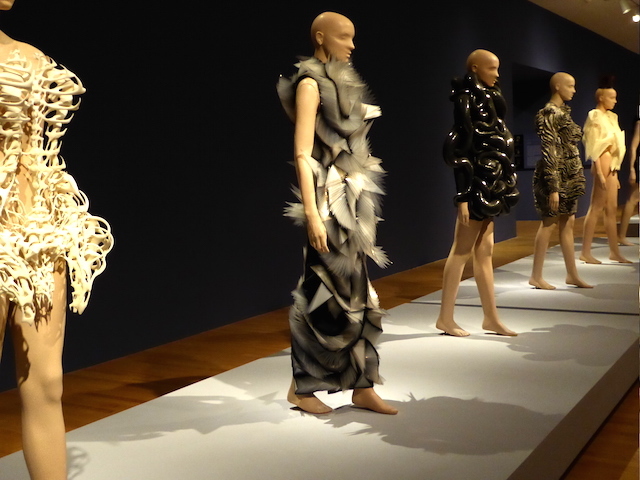 She utilizes traditional handwork (still) but also incorporates materials made with a 3-D printer, materials not associated with garment construction. The results are “other-worldly” and mesmerizing. There is a notable absence of color, which places greater emphasis on structure. 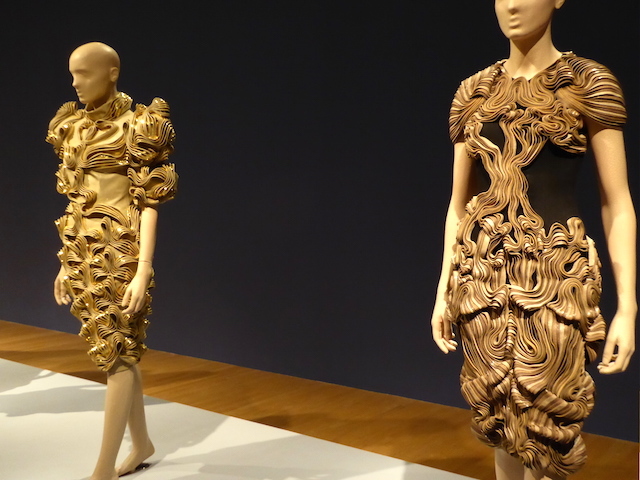 Sometimes she collaborates with other artists such as the architect Daniel Widrig and Jolan van der Wiel (shoes). The Refinery Smoke collection (2008) utilized thin gauge woven metal to create a giant pouf. 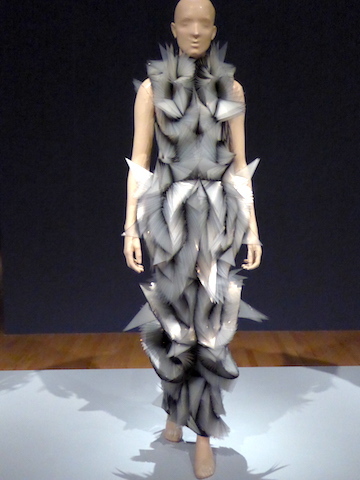 The Crystallization collection (2010) incorporated 3-D materials for the first time. 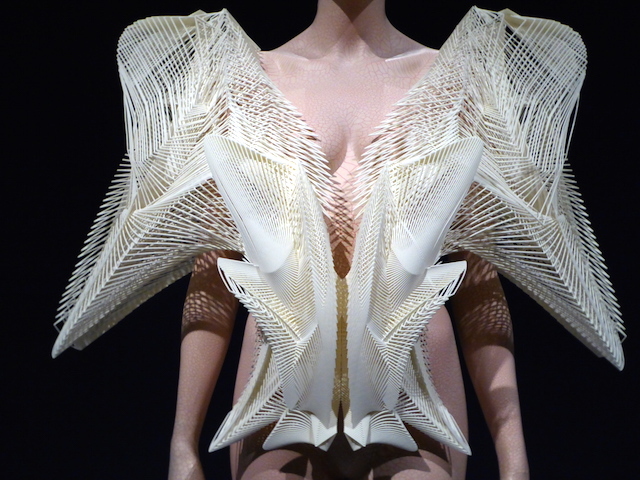 The Escapism collection (2011) combined handwork and 3-D printing, creating a lace-like garment without needle and thread. 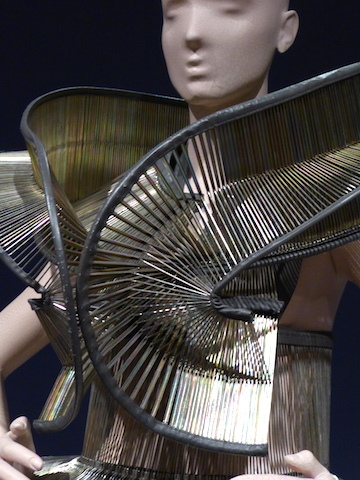 The Capriole collection (2011) has acrylic sheets wrapping around the body or prominent spikes. The Chemical Crows collection (2008) was made entirely by hand, including fan-like shapes from umbrella ribs. 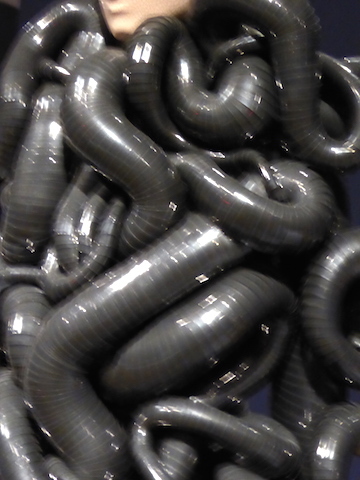 The Radiation Invasion collection (2009) looked to science and its relation to the body for inspiration. The Synethesia collection (2010) took science as its starting point. The Magnetic Motion collection (2014) was made in collaboration with Philip Beesley and combined 3-D printing with handwork. The exhibit will continue on to Cincinnati, Phoenix and Toronto. Run, do not walk, to this exhibit!